Perhaps you heard about window film for a friend or maybe you read an article about it online. Either way, you’re ready to invest in window tinting for your home. It is, after all, one of the most cost-effective ways to upgrade the performance of your windows. But how do you choose between all the different brands out there? Furthermore, how do you decide what style is best for your home? What window tint is best for your home truly depends on your situation and what your concerns are. However, if you’re torn between options, you may want to consider a versatile, four season window film, such as 3M Thinsulate Window Film. 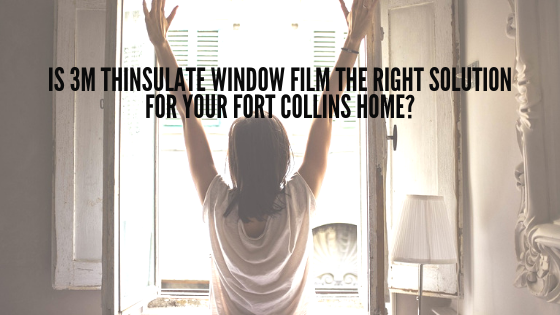 In Fort Collins, this window film is a popular choice due to its year round benefits. In the summer, Thinsulate keeps your home cool while in the winter, it helps to trap in heat and help you stay warm during the snowy Colorado winter. Below, we’ve described some of the reasons that Thinsulate Window Film is a great option for Fort Collins. If you’ve never heard of Thinsulate or four season window film before, you may be curious how it works. It’s important to understand that Thinsulate is different than most window films. Most traditional window tint only works one way – it keeps heat out. But Thinsulate blocks heat and traps it in. During the summer, it prevents your home from becoming too warm and during the winter, keeps you from shivering and getting too cold. Thinsulate Window Film is one of the best performing window films for dual climate environments that receive both intense summers and cold winters, like Fort Collins. The energy savings from installing Thinsulate Window Film are significant. By making this simple upgrade to your windows, you could save anywhere from 10-30% on energy costs during the course of one year. Want to know more about 3M Thinsulate Window Film? Contact our Fort Collins team to get more information or learn about the different window tinting options available to you.